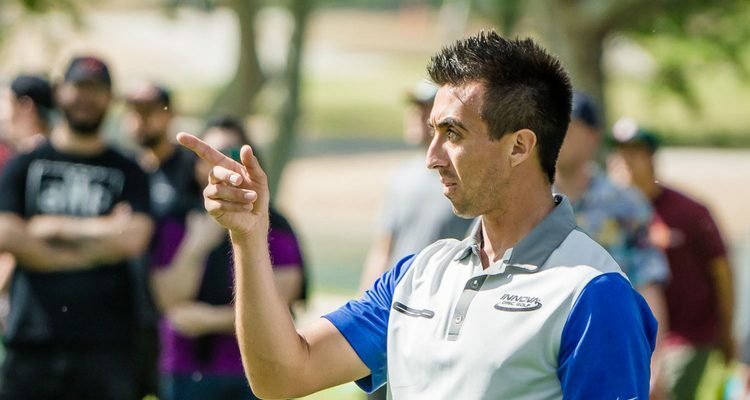 I had the opportunity to talk with Paul McBeth recently. It was late on a Thursday afternoon, July 28, as he was preparing for The Majestic tournament in East Bethel, Minnesota. I was not in Minnesota, so the interview was over the phone. Paul is a self-admitted quiet person, but there is an exception when he talks about disc golf. McBeth is the top player in the world, with a rating of 1054. He has seen his highest ratings for his career in 2016, ranging from 1054 to 1056. Only one other player in the world is rated close to Paul, and that’s Ricky Wysocki — he is currently rated at 1048, and the next closest is in the mid-1030s. With those ratings, Wysocki is rated roughly ½-stroke behind McBeth, which is about as tight as it can be. In short, you do not beat either of these players — you wait for them to lose to themselves. Jonathan Poole of Innova had arranged the interview for me. Paul was coming off of a 1-stroke loss to Ricky Wysocki at the European Masters in Stockholm, Sweden, over July 21-23. If you follow disc golf, you cannot miss the contest between these two players on the courses. I started by asking Paul about the loss at the European Masters. How was he feeling about it a week later? The PDGA Pro Disc Golf World Championships are held on August 6-13 in Emporia, Kansas. This tournament is a focal point in the sport, and it is the next big battle between McBeth and Wysocki (though both are playing in The Majestic). I was curious if the loss in the Euro Masters provided even more motivation for the Worlds. And I was curious about another aspect of this competitive back-and-forth. With Paul and Ricky battling each other almost by default, how does it impact their rapport? “There are always parts of my game that I can work on, and I’m always motivated to play better. Losing is also a motivator, but my main motivation is always playing my best. Every loss motivates me, and every tournament motivates me even more. I basically stay motivated and stay focused. So, does a loss motivate me much more for upcoming tournaments like the Worlds? Not really. I’ve been focused on the Worlds for a while. “Ricky and I are friends during the off-season, and even train at the same place some. In tournaments, I try to win and so does he. But, as to myself, I’m not very social. I’m quiet. We are still friends during the season, but we generally see each other at tournaments, and I’m focused on my game and what I need to do. “We enjoy battling with each other, but we are not really battling or playing against each other in a tournament as much as it seems. We are playing more to our own abilities and to our own games. Sometimes people misunderstand about the actual battle because they are not in that arena. I’m playing against myself. I’m sure Ricky is doing the same. We stay focused on our own games. And we are both doing that rather than playing against each other. We both want to win, and what happens, happens. For disc golf fans, the coverage of the Worlds will be extensive online. There is no doubt that energy is funneling into that tournament. It’s the Worlds. And according to McBeth’s comments, it has been concentrated in that direction for some time. Do not miss it. You’ll see the best disc golf in the known universe.